Comfy is pioneering a people-centric approach in the growing smart buildings industry. Its product is a software-based system that provides individuals in workplaces with a smartphone application to send very highly-localised feedback to the building’s temperature-control systems, in order to maximise the comfort of occupants. The product Comfy is offering is new. It’s not one of numerous similar and generally familiar choices, but a brand-new approach to a problem, and a concept that potential customers may not have previously encountered. This means that the Comfy website not only has to explain the concept and the benefit of the product quickly, it also has to do it in a way that is engaging from the outset, so the visitor will decide to spend the extra minute or two required to appreciate what’s being offered. The site also needs to address different audiences (business managers, property owners and of course, the building occupants whose comfort is the main purpose of the Comfy system), ensuring that each quickly will find the site’s message for them. Comfy’s old website was built in Mezzanine, a popular Django-based CMS. Mezzanine is very easy to get started with, but not so well suited to a more complex site with integrated applications. 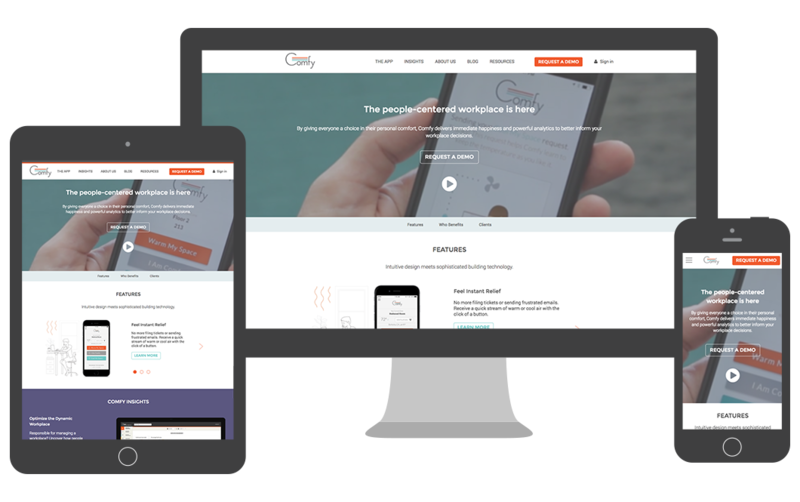 Comfy’s marketing team needed to be able to work on, and even rework the site substantially, without recourse to the company’s IT team - all this had to be manageable within the site’s content management system itself. As well as improvements to the site itself, Comfy also sought a solution that would take care of site deployment and management, freeing up Comfy's developers for work on applications rather than on system administration. The combination of django CMS and Divio met both their key requirements. Migrating Comfy’s existing site data was a smooth process. Django provides flexible database export functionality that produces well-structured output in multiple formats. The existing content was quickly imported into django CMS and other applications in the ecosystem, including Aldryn News & Blog and Aldryn People. These applications meet Comfy’s needs well, and they’re flexible and extensible enough to be configured for their specific requirements without modification. Comfy required some additional functionality, which was quickly delivered in a new pluggable component, keeping the original codebase unmodified. Finally, some event triggers for backend processes were incorporated, to support Comfy’s use of Marketo. The overall CMS migration was a breeze. Divio helped us smoothly transfer our existing weblog and other content over to our new site, while working with us to update the build and functionality of our main pages and site navigation. The depth of knowledge the Divio team brought to the project made translating designs and ideas into Django functionality a pleasure and a success. Comfy wanted to project a new image through the site, to reflect a successful transition from startup with a promising future to a stable and growing company that was already serving its customers with a valuable product. Working with comprehensive mockups and designs from Comfy, our team built them into a streamlined frontend implementation. Comfy's design is expressed using components based on modern frameworks and tooling, and fully integrated into the functionality of the site's Django applications. Our implementation of Comfy's design is supported by a styleguide to ensure that any new applications or content created will integrate well into the site. Together with the new frontend underpinnings, this will make it easier to work on in the future and provide better opportunities for further development. Using components such as Gulp, Babel, SASS and webpack makes possible a great deal of frontend automation. Along with comprehensive frameworks such as Bootstrap, it also helps reduce boilerplate and improve reliability. These tools are also able to optimise frontend code by compiling and minifying it for deployment. Comfy is a technology company, with experienced software developers already on board. Comfy's developers are also already familiar with Django both as users and developers. What they want to concentrate on developing however is their own software, rather than being responsible for the applications on their public-facing website, or being required to help the marketing team perform substantial updates to it. Comfy now has a website running applications that are being actively and continuously developed. Updates and new features will always be available, while the stable nature of the ecosystem guarantees that new releases of django CMS or the addon applications will work reliably when deployed into the Comfy site. Deployments themselves are now handled by the Divio Cloud platform, and - like installation of software updates and new applications - can be run with a single click from our web control panel. Divio provides a staging server to which changes are always first made, so before a live site deployment, all changes can be checked in an identical private environment. Comfy’s site now benefits from up-to-date, stable software on both the frontend and backend. It’s ready for future developments and to be extended to meet whatever new needs come its way.